Citation: Brij K Gupta. 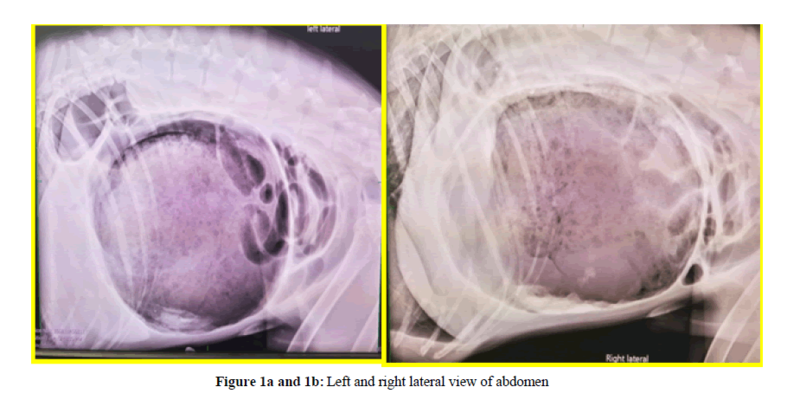 A case of Gastric Dilation Volvulus (GDV) in a canine in general practice. J Vet Med Allied Sci 2018;2(2):1-3. GDV is a devastating disease predominantly encountered in speciality and emergency practice. Patients with GDV usually are bloated, show symptoms of vomiting, difficulty in breathing, and overall discomfort. A high morbidity and mortality is commonly seen in these patients. Prompt and accurate diagnosis is the key to save patient and reduce concurrent morbidity and mortality. The objective of this case report is to freshen up clinician's knowledge and give additional insights about GDV cases in general practice. A 79.2 lbs, 5-year-old, neutered male Labrador dog was presented on April 21, 2018 at the Banfield Pet Hospital Denton TX location. This patient was seen for the first time therefore no prior health history was available. At the time of presentation, according to owner, the patient was lethargic at home and appeared to be in pain during walk. Owner also noted distended abdomen prior to presenting in the hospital. Upon inquiring patient history, owner informed that they were not aware of prior history of any bloat or possibility of any foreign body ingestion/toxin/garbage exposure at house. However, they stated that their parents visited them few days ago, and the patient got excited during interaction with them. The typical symptoms of dogs with GDV often present in shock condition. These dogs usually have pale mucous membranes, prolonged capillary refill time, weak but rapid pulses. The abdomen is often distended and firm to palpated. An enlarged spleen is often palpable due to splenic congestion. The pathophysiology of GDV involves severe gastric distension due to compression of the abdominal caudal vena cava. Abdominal distension also results in obstruction of the portal vein supplying the liver which in turn causes lack of venous return to the heart results in decrease in cardiac output, blood pressure and microcardia . In this case, a full physical examination was performed. During the physical exam the patient appeared bright alert and responsive. The physical parameters including temperature, pulse, and respiration was within normal limits. Heart and lung ausculted good without any abnormal heart and lung sounds. The abdomen was distended and painful to palpate, however. Orthopedic exam was unremarkable. Patient showed discomfort while walking few steps in the exam room. Rest of the physical exam findings was unremarkable. Previous and current vaccination status and history of external/internal parasites was not provided by the owner. Based on patient history, physical exam findings and clinical presentation a list of presumptive diagnosis including GDV, foreign body ingestion/obstruction, splenic torsion, gastrointestinal neoplasia, peritonitis, pancreatitis and GDV was made. Owner was recommended to do full panel of blood work including electrolytes, CBC and serum chemistry panel, UA, CPL and radiograph test to rule in and rule out underlying cause, to identify the precise etiology and to arrive at accurate diagnosis. Owner declined blood work and other diagnostics offered due to financial constraints and opted to do radiograph of the abdomen, however. An abdominal radiograph was performed after proper restraint. A total of 4 views; 2 laterals (left and right, Figure 1a-1b) and 2 ventro-dorsal (cranial and caudal, Figure 1c-1d) were obtained. The radiographs were sent to radiologist for immediate consultation. Based on the radiologist consultation report (Appendix 1), a confirmatory diagnosis of GDV was made and it was immediately notified to owner. A treatment plan including medical stabilization followed by emergency gastric decompression was recommended at the earliest with prognosis being good. Owner was also made aware that without surgical intervention prognosis of patient was poor/ grave, and patient may eventually succumb due to the necrosis of GIT and ablation of blood supply to heart and other proximal and distal adjacent organs. Unfortunately, because of the cost associated with medical stabilization and surgery and owner’s financial constraints, owner elected to humanely euthanize this patient. GDV, also known as acute gastric dilatation (AGD) or bloat, is a one of the acute life threatening medical emergency cases requiring prompt medical attention for successful outcome. GDV occurs when the pylorus is mispositioned. Several factors predispose GDV including genetics/breed of dog, food texture/ quantity/quality/ingredients, emotional state, age and present of foreign body in GIT . GDV affects approximately 60 000 dogs annually in the United States . Large and giant breed dogs such as Great Dane (GD), German Shepherd (GS), Mastiffs, Labrador Retriever LR), Doberman Pinscher (DP) and Akita are at higher risk of GDV because of their deep chested anatomy . It is reported that approximately 80% dogs at the time of presentation have worse prognosis and may die if immediate medical attention including surgical correction is not performed . These GDV cases also enormously increases financial and emotional burden to the owner. In almost all the circumstances these cases warrant prompt and accurate diagnosis and requires medical stabilization of the patient prior to surgical intervention. Surgical intervention involves gastric decompression and repositioning of stomach in its normal anatomic position . GDV is usually encountered in the emergency hospital for acute illness but it can be seen in general practice, occasionally. However, when presented; the clinician should have sufficient knowledge to accurately diagnose and treat these emergency cases. Accurate diagnosis of this acute but rare disease and developing appropriate treatment strategy is vital for successful clinical outcome. The purpose of this case report is to refresh the essentials of GDV in clinical practice. In the current report, we made a presumptive diagnosis of GDV based on presented history, physical exam findings. The other etiology for presented clinical symptoms included pancreatitis, splenic torsion, foreign body ingestion and GIN among others. It is imperative to work up these differentials by performing appropriate diagnostics including full panel blood work, UA, CPL test, radiograph and abdominal ultrasound. In the current case, owners were offered these diagnostics, however, most of these diagnostics were declined and owner opted abdominal radiograph only. 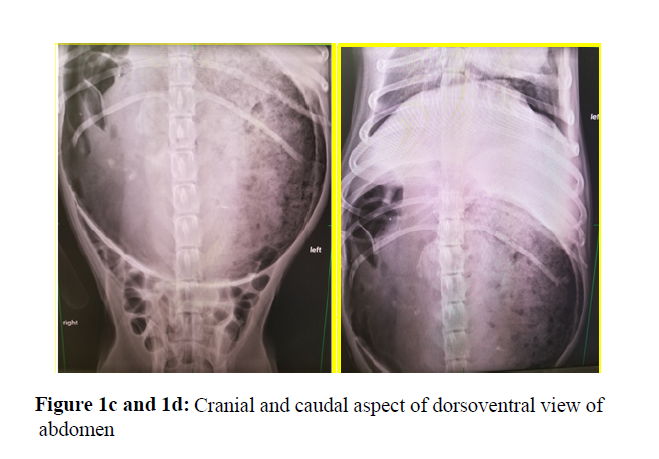 Radiologist report revealed a typical radiograph finding associated with GDV such as marked distended abdomen, dorsal displacement of the antrum with suspected compartmentalization, narrowing of the caudal vena cava and suspected microcardia due to reduced return of blood from the abdominal viscera and hypovolemia. These radiographic findings are very typical for GDV cases. All these findings together with physical exam findings confirmed the diagnosis of GDV in this patient (Appendix 1). Radiograph findings, patient prognosis and treatment options including medical stabilization (fluid resuscitation through isotonic colloid for first hour to correct shock followed by crystalloid therapy for maintenance therapy) and immediate surgical correction was offered to owner. However, due to higher cost of surgery associated with these recommendations, owner elected to humanely euthanized this patient. While the prognosis without medical stabilization and surgical corrections in GDV cases are guarded to poor. There are few techniques to minimize and to prevent GDV in deep chested dogs. Gastropexy, a technique, commonly used to securely adhere the stomach to the body is reported to be effective and decreases the recurrence of GDV from 80% to less than 5% . Therefore, clinician must, educate clients about the morbidity and mortality associated with GDV in deep chested dogs and offer gastropexy at the time of celiotomy (e.g., ovariohysterectomy) for any surgical procedure to avoid recurrence. Maki LC, et al. Incidence of gastric dilatation-volvulus following a splenectomy 238 dogs. Can Vet J. 2017;12:1275-80. Hall JA. Canine gastric dilatation--volvulus update. Semin Vet Med Surg (Small Anim), 1989;3:188-93. Van Kruiningen HJ, et al. Stomach gas analyses in canine acute gastric dilatation with volvulus. J Vet Intern Med. 2013;27: 1260-1. Allen P, Paul A. Gastropexy for prevention of gastric dilatation-volvulus in dogs: history and techniques. Top Companion Anim Med. 2014;29:77-80.